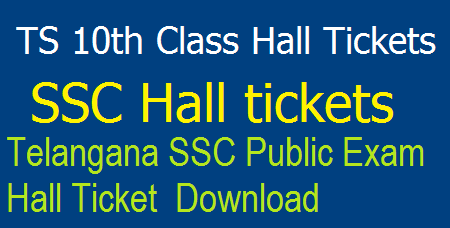 TS SSC Hall Tickets @ bse.telangana.gov.in | Download Telangana 10th Class Public Exam Hall Ticket March 2018 : TS SSC Hall tickets 2018 Download Telangana SSC public exam Hall Tickets available from 9th, March at bse.telangana.gov.in, manabadi.com and schools9.com. Telangana Education issued SSC public exam Hall Tickets Download from 9th, March 2018 on its official website bse.telangana.gov.in, manabadi.com, Schools9. Board of School Education has released the hall tickets for the 10th class regular and Supplementary exams March 2018. Telangana 10th Hall Tickets 2017-18 are also available on to official website bse.telangana.gov.in to download. Board of Secondary Education BSE Telangana will be TS SSC 10th Class Hall Tickets 2018. This year TS SSC Public Examinations start from 15th March 2018 and it completes on 02nd April 2018. So hall tickets for these examinations are released in the official website before 10 days of the exam date. 2. Search for Hall Ticket download link & Click on it. 3. Select your own district name. 4. Enter your Name/father Name. 5. Take the print out & keep it a safe place for future use. TS 10th Class 2018 Hall Tickets @ bse.telangana.gov.in – Download Telangana SSC Public Examination Hall Ticket March 2018.